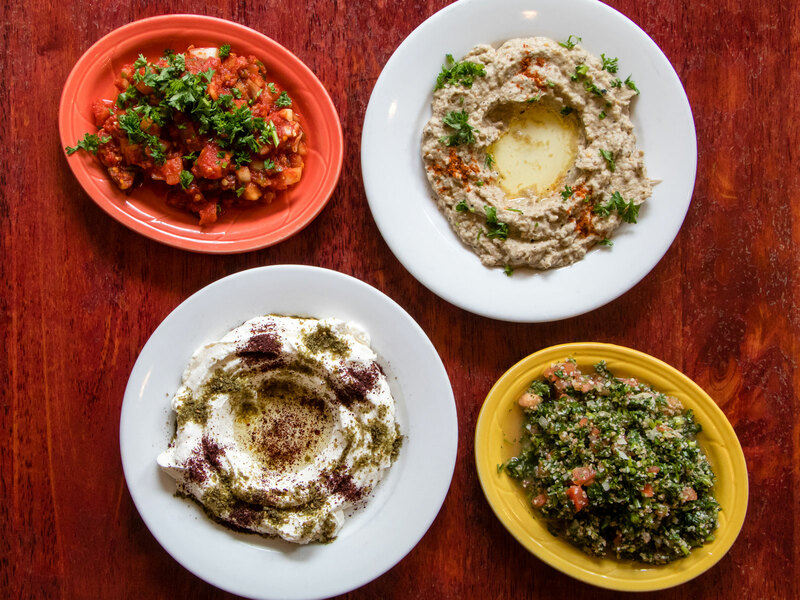 Gazala Halabi is poised to open her second Druze restaurant on the Upper West Side. If you’ve never heard of Druze, it is both a culture and a religion, says Gazala Halabi. It is one with Abrahamic roots and myriad influences including Islam, Gnosticism and Hinduism. The chef grew up in a Druze community in Daliat el-Carmel, a village near Haifa, Israel. It is from there that so many dishes at her New York restaurant, Gazala’s Place, have their roots. There is foul mudammas, that comforting stew of fava beans that is best in the morning, topped with onions, perhaps some boiled egg, and accompanied by a crust of bread. Hummus, which is on the lighter side here, is served with griddle-fired pitas, although you probably wouldn’t recognize them as such. Called sagg pitas, they’re named for the domed sagg griddle they’re cooked on. Nearly two feet across, they’re paper-thin and almost crepe-like—and apparently even bigger in Israel. Halabi tried to import the enormous traditional cooking surface from Israel, but the restaurant’s fire code didn’t allow for its installation. When she moved to New York with her then-husband at 21, she hadn’t packed any pants in her suitcase. Growing up, Halabi was not allowed to wear them. “I wore pajamas, but if I took one step from the door, I had to change into a dress,” she says. Today, pants are all she wears at work, as a chef-owner of one, soon to be two, restaurants: Her second location of Gazala’s Place will open on the Upper West Side in about two months, nearly ten years after the opening of her first. Looking back, she considers it the unlikeliest of stories. “The first few years in America, I didn’t know what to do,” she says. “I was scared. I was different.” For the first three years or so, she really couldn’t do much of anything. Homesick, she comforted herself with baking recipes from home. “For me, everything was a hard. It was a different country, it was a different people, it was a different food. It was different in every way,” she says. Finally, forcing herself to make money to get out of a financially bleak situation, in 2005 she started selling date cookies—a traditional recipe from her childhood. First it was to friends; soon enough, to Middle Eastern and Greek restaurants and spice shops. Slowly but surely, that cooking took on a life of its own. After about two years of doing this, she saw a small commercial space open up in Manhattan’s Hell’s Kitchen. It was only about 400 square feet, give or take, and didn’t even have a kitchen at the time. She decided to seize the opportunity. Halabi hired an architect—actually, she didn’t have the money to, and received no financial support from her husband—so she asked him if he could effectively consider it an investment in the restaurant. He thought about it for a few days, and said yes; he built out a burner and a sink and a cooking surface. Quite immediately upon opening, Gazala’s Place seemed to be a hit. Halabi would stand in front of the restaurant’s window, in front of that sagg grill, flipping pizza-sized pitas. It turned out to be great advertising; people, curious, came in. Three months later, the New York Daily News came calling. And four months later, another big one: Peter Meehan of the New York Times stopped by, for the outlet’s $25 And Under vertical. “I didn’t even know what the New York Times was,” says Halabi. But enough people did so that there was a seemingly eternal line snaking out the restaurant, from before its opening until just before close. It was more than Halabi or her dishwasher—still only two of them in the kitchen at that point—could handle. It’s been a decade since those blurred memories; Halabi has since acquired a staff of five. These days, she no longer lives in Hell’s Kitchen a block away from her restaurant; she’s moved to the Upper West Side. She also is no longer with her husband.